A big (and fun!) part of the whole wedding experience is gifts. Maybe a few engagement gifts, shower gifts, wedding gifts. 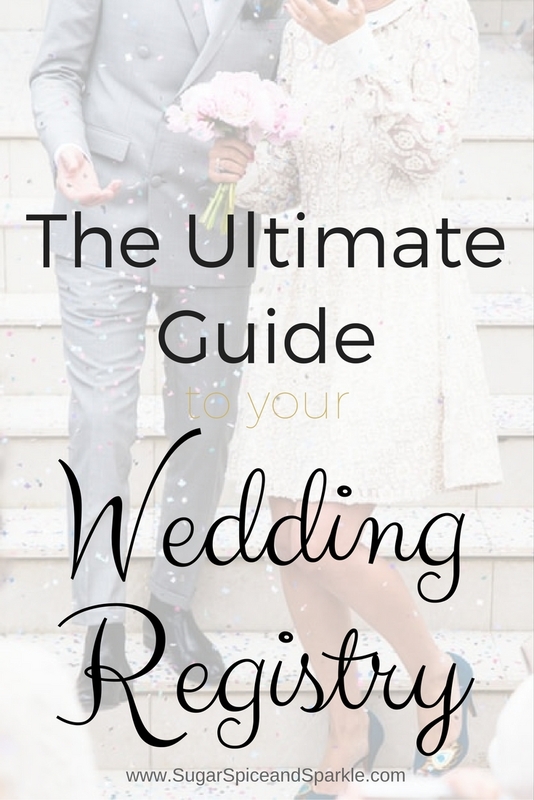 #allthegifts As with anything wedding even something as fun as presents can be overwhelming, but this guide is here to help! Having a registry makes it easy for your family, friends, and guests to get you something. People want to get you something you'll actually like/use, so a registry just makes it simple. Of course this will depend on your preference, as pretty much every place has a registry these days. Some common ones are: Amazon, Target, Macy's, Bed Bath & Beyond, Crate & Barrel, the list goes on and on. I knew I wanted to register at Target because, hello, who doesn't love Target? Hubby was interested in the Amazon registry because you can register for almost anything on there! We had a third registry at Bed Bath & Beyond for fancier things like flatware and dishes. You can link up items for ANY site, then people viewing your Amazon registry will get redirected to those items. So you can really register for anything that is sold online! They make thank you notes easy (and you BETTER be sending thank you notes!!). It kind of ruins the element of surprise, but you can see who bought you what and their address so that you can do thank you notes super easily. After your wedding you get a coupon! If there is anything left on your registry that you have to have but didn't get, you can use your coupon to buy it at a discount. How much you ask? 10% off for all registries, but 20% off if you're an Amazon Prime member! Such a cool deal - Try Amazon Prime 30-Day Free Trial . A lot of your guests may like using Amazon because it's convenient and often cheaper, however, some guests may be more traditional and want to purchase something in a store. Enter the brick and mortar registries (granted these days even the physical stores are also online). There are just so many adorable home items at Target you will want to register for! We got all of our towels, glasses, and dishes off our Target registry. Oh and some super cute, gold, serving bowls/platters! Target was cool because you can use your phone as a scanner to add things to your registry as you shop. So easy and just like you see on TV! Ha! You can even put a Target gift card as an item on your registry - we got a lot of these, who doesn't love a gift card? Target also offers a 15% off coupon to use on anything left on your registry after the big day. If you also have a RED card on top of that you'll be saving quite a bit! At BB&B you get the star treatment! You can sit down with a wedding registry consultant and they will help get you started. They'll take you through the store and scan anything and everything you want on your registry. They can also make recommendations for you if you aren't sure what to register for. Remember to put items with a wide range of prices on your list in case people want to make you a gift basket with a lot of smaller items or go in with others for something big. When you're done shopping they print you out little cards saying you're registered there to include in invites. This could be an entire post on it's own (and there are plenty of those over on Pinterest) but I'm going to keep it relatively simple. Rule number one if you're a traditional gal like me - registries are for "nesting" items ONLY. I am personally not a fan of registries where you pay for part of the honeymoon, or for frivolous items, or technology. Now I'm not here to judge - you do you boo - but it's me blog so you get to read my opinion :) Rule number two - keep it simple and classic. My motto is "all white everything" then when I finally do pick a color scheme, all my stuff will match. Yay! Now on to what ya need! I've linked to some of our exact items if you're curious! That is a pretty good summary of what we got. Some people do go rouge and get you something not on your registry *gasp* but those gifts are often some of the most thoughtful. Of course we love everything we got from our registry - we picked it out! But I think my favorite gift was one from one of my bridesmaids at my shower - it was a wedding 'advent' calendar for the week of my wedding. There was a little gift to open each day. It was so thoughtful and creative, I just loved it! Well, any questions? Comment below, I'd love to help if I can! Just attended a wedding here. We had hot, delicious meals. The wedding was amazing, everyone had such a great time. The space was elegant and impressive. The coordinator from NYC wedding venues really appears to love her job, she had a smile on the whole day. Even after the wedding ended.